What makes him do what he does? He pops up on WhatsApp again, and again, and again. He shows up on the airwaves over, and over, and over. He becomes the voice in your head, echoing, and echoing, and echoing. 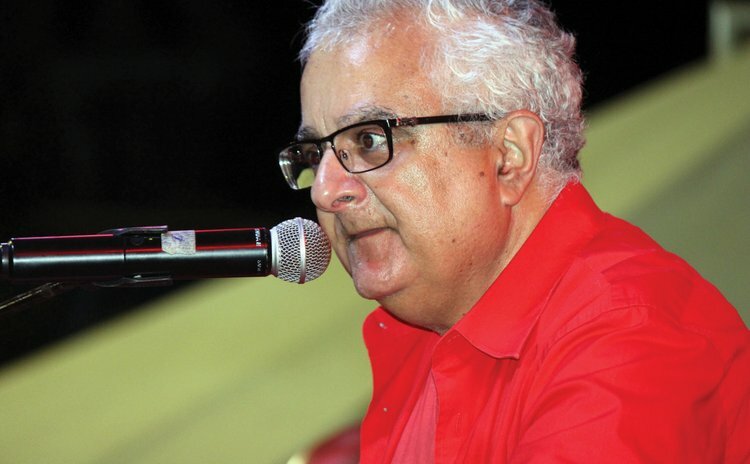 Tony Astaphan, the most unabashed, unapologetic, unrepentant defender – critics say apologist and apostle – of Roosevelt Skerrit is everywhere. An omnipresent protector of the country's leader. And the message is simple – Linton bad, Skerrit good. "I consider myself more of an advocate than a defender," he tells The Sun. But as a successful and respected attorney, he knows about evidence, and the evidence is clear. No criticism of Skerrit, no allegation, no form of condemnation escapes Astaphan's protestations. The prime minister's every decision, every move, every programme is stoutly defended and explained with conviction and, often, sheer disdain for the opposition. "I have a peculiar position where if something happens in relation to Roosevelt Skerrit, [St. Vincent prime minister] Ralph Gonsalves, [Antigua prime minister] Gaston Browne, who I represent, I have the unique position where I can call them anytime, or go into cabinet or their office and asked for documentary evidence and I can honestly and confidently advocate a view on their behalf, either in the media or in the court," he explains. "And if I didn't have that close personal relationship with them it would make my life more difficult." As a successful attorney who can very easily pick and choose high profile cases anywhere in the commonwealth, Astaphan certainly can leave this level of politicking to lesser mortals, many suggest. However, he also has a seemingly insatiable thirst for all things politics – after all, politics was his primary love, he says - and he simply cannot sit by and allow falsehoods about Skerrit go unchallenged, he insists. "There is a common belief that fake news, alternative facts and lies are the order of the day. And for people like Roosevelt Skerrit – there were attempts to destroy him, to smear him . . . I'm fiercely opposed to the smear campaign. So every time I go on [the air] or I sue, it is after I have discussed with the prime minister and I'm satisfied [with the information I have]. Sometimes it's difficult for a prime minister to defend himself," Astaphan adds. He insists there isn't a shred of evidence to support the many allegations of corruption, sale of diplomatic passports, nepotism and the myriad other charges made against Skerrit. And merely presenting a single document, he says, does not equate to evidence. It is a lesson he learned in the court battle over the dismissal of Julius Corbett from the National Bank, he says. A battle he lost at the Privy Council. "And then it struck me, we've fired this man, we relied on minutes and travelled over three thousand miles for someone to tell us 'you need more than documents, you need evidence'. And that's the basis on which we lost the case, not on the basis on law. And we have to explain to the people of the Caribbean that you cannot take a single document and [convict] people" Clearly, he is enjoying this, particularly the counterpunching against a man who he believes does not belong in Skerrit's shadow. "In contrast to Lennox Linton, Roosevelt Skerrit stands 100 feet tall. Linton is now finding out it is a lot easier to talk on the radio where nobody can challenge you than to be a political leader . . . and put aside the smear campaign, the Dominican people have not had a credible alternative plan from the current UWP [United Workers Party] leader on anything. Astaphan has come in for criticism for his approach and some of the things he says. He admits he has said some things he is not proud of and, with the benefit of hindsight, would not say again. But then, weigh his "one or two mistakes" against the relentless attacks against Skerrit and his errors seem small, he suggests. "I made one or two mistakes, but there are times it's difficult to stay entirely objective and calm when you listen to some of the things said about the prime minister and dragging his family into it." Yes, he will keep popping up. Everywhere. That voice in your head, echoing, and echoing, and echoing.